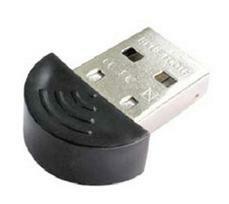 A truly small and compact Bluetooth Wireless USB adapter for Phone, PDA, Notebook and the rest of your digital life. The new Dynamode BT-USB-M2 breaks the unadventurous design of competing Bluetooth� adapters by offering most of the host electronics within the confines of the actual USB connector! Result - a Bluetooth� adapter which can be left permanently plugged into a Notebooks USB Port, while in its Notebook bag, or moving from office to office without fear of the device becoming unplugged or damaged. Fully Bluetooth� Version 2.00 compliant for simultaneous connections to other Bluetooth� devices and a high-powered Class-1 100 metre range using a data transmission of up to 3Mbps coupled with extensive Wireless security. Ideal for Bluetooth� PAN (personal area networking), VoIP applications, data transfer and Fax/Dialup applications, the new Dynamode BT-USB-M2 breaks the convention in discrete Bluetooth� connectivity.